It feels brilliant to have reached the landmark of 3,000 jumps winners in Great Britain with the success of Kupatana at Cheltenham today. I’ve had the total in my sights all season and the expectation of getting there has meant quite a lot of pressure. 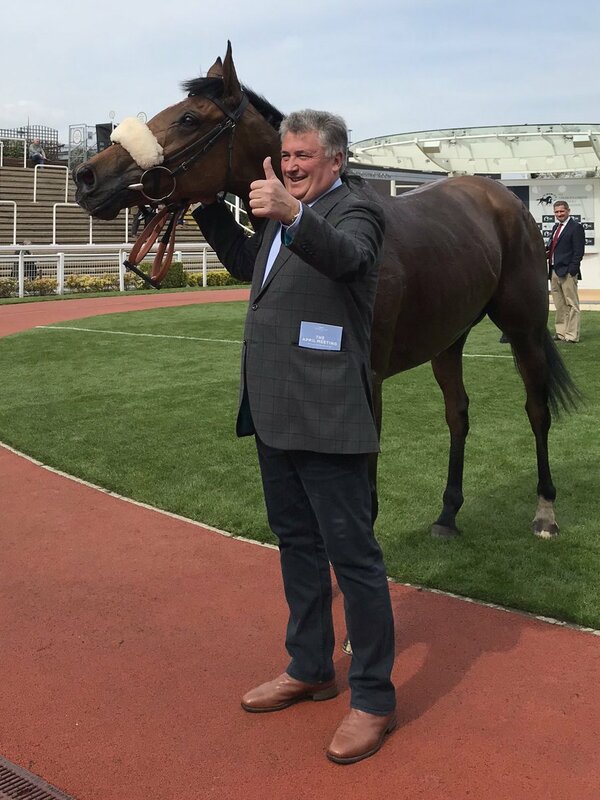 It has been an amazing journey since Paul Barber gave me the chance to start training at Ditcheat in October, 1991 and to achieve it at Cheltenham is perfect. Reaching 3000 winners is quite a landmark and something to be proud of and I could not have managed it without everyone at home who are part of Team Ditcheat. They all work hard with enthusiasm and do their bit.Now I can take my foot off the pedal and enjoy it before looking ahead to the next challenge of 4000 winners.All we have to do is keep going and finding the nice horses for the future. If we do that I’d say 4000 is quite achievable. I am just as driven as I have always been. It’s winners that count. Eight winners over the past three days kept up the momentum for Team Ditcheat as we enter the final two weeks of the season. I am also counting down the numbers as I approach the milestone of training 3000 jumps winners in this country. That is a figure beyond my wildest dreams when I began at Ditcheat with eight horses in October 1991. The total currently stands at 2,999 and with any luck I will reach the landmark sometime this week. Getaway Trump and Secret Investor were notable contributors to the tally at Ayr’s two day meeting but a couple of others including Malaya found the drying ground against them and Ibis Du Rheu was pulled up after another horse struck into him behind. It was good to see Getaway Trump bounce back after a below par run at Kelso last time. Given that his jumping was mustard I can’t wait to see him over fences next season. Before then he will have an entry at Sandown on the last day of the season. Secret Investor also impressed at Ayr with a forceful display in the Grade 2 Champion Novice Chase, a race we have won seven times. He was full of running at the line and seems to enjoy drier ground now that he has got his jumping together. As Secret Investor remains a novice until November I will look for a suitable target for him in October, possibly at Chepstow. On Friday our excellent claimer Lorcan Williams was the star of the show at Fontwell as he landed his first treble on our trio Captain Cattistock, Danse Idol and Romain de Senam. It is exactly two years since Lorcan had his first winner at Fontwell. He has worked really hard to earn his chances and is now making the most of his opportunities. Lorcan was among the winners again on Sunday at Wincanton where a treble by Southfield Torr, Southfield Vic and Eritage took the yard’s score for the season to 129. It is great to see the horses still in such good form and we will have some interesting runners at Cheltenham midweek including Dolos in the Silver Trophy on Wednesday. We’ve decided to keep Diego Du Charmil fresh and in top form for the Grade 1 Celebration Chase at Sandown on the 27th as it looks increasingly likely the ground will be too fast for Cyrname. On Thursday we plan to run Kupatana and possibly Miranda and Posh Trish at Cheltenham. The only other notable runner this week could be Scaramanga in the Sussex Champion Hurdle at Plumpton on Sunday. Not everything went to plan at Aintree but our horses still earned significant prize money over the three days to take our total for the season soaring past £3 million. This is the fifth time Team Ditcheat has passed that notable landmark and the first since 2014-2015. It’s is a highly pleasing total when you consider that we only had eight winners on the board by the end of September and were not in the first twenty in the trainers’ table. Unexpectedly soft ground after heavy rain at Aintree on Thursday didn’t help some of our runners. Others including Clan Des Obeaux, Topofthegame and Politologue ran well without quite showing their best form. They each finished second in Grade 1 races keeping on without looking like winning and will soon be heading off on their holidays. Topofthegame probably ran a little bit flat and I’m inclined to put a line through the run as nothing went to plan at all during the race. He is still a novice until the 1st of November, so as a prep race for the Ladbroke Trophy I might find a small novice chase for him. On Friday McFabulous gained his third win from four starts with a hard earned victory in the £25,000 Grade 2 Weatherbys Bumper. The first horse I’ve trained for Giraffa Racing, he is still a bit of a baby but has a huge engine and will be an exciting recruit for hurdles next season. Christopher Wood did well to finish third in the Grade 1 Juvenile Hurdle on Thursday considering that he would have been much happier on good going. He is highly promising and could turn out in a £100,000 novice handicap at Sandown on the final day of the season. This weekend we will be taking a team to Ayr including Ibis Du Rheu in the Scottish Grand National, Malaya in the Scottish Champion Hurdle and Secret Investor in the Future Champion Novice Chase. For the latest news on my runners on Saturday please turn to my regular Betfair column which goes live late afternoon on Friday. Finally I would like to pay tribute to Tiger Roll for his superb second success in the Grand National. The reception he got afterwards well and truly set Aintree alight and the whole day was a great advertisement for jump racing. Tiger Roll is a magic little horse, doesn’t waste any time in the air and stood out a mile in the paddock beforehand, head and shoulders above everything else. The crowd loved him, he is brilliant for racing and is arguably a Gold Cup horse running in handicaps. What a star.